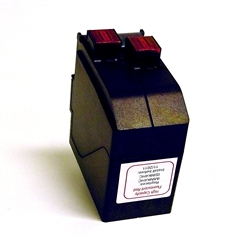 Replaces ink cartridges IMINK4HC and ISINK4HC Hasler® IM420, IM440 , IM460 , IM480 and Neopost® IS420, IS440 , IS460 , IS480 mailing machines. Double the capacity of IMINK34 (up to 17,000 impressions)! Fluorescent red ink meets or exceeds postage industry standards. Limited availability. CHECK YOUR MACHINE MODEL BEFORE ORDERING...HIGHER CAPACITY CARTRIDGES DO NOT WORK IN ALL SAME MODELS AS IMINK34/ISINK34.